This week in San Diego, CA the US Navy held the initial planning conference for Trident Warrior ’10. 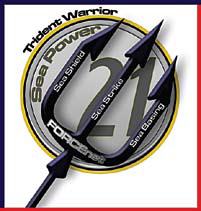 The Trident Warrior series is the premier annual FORCEnet Sea Trial Event sponsored by Naval Network Warfare Command (NETWARCOM). FORCEnet’s experimental results are incorporated into a definitive technical report used to develop Military Utility Assessment (MUA) recommendations. This report is provided to the Sea Trial Executive Steering Group (STESG) for consideration and acquisition recommendations. The primary goal of FORCEnet experimentation is to influence accelerated fielding of improved Command and Control (C2) capabilities to the fleet through Program of Record (POR) acceleration or transition of new technologies into PORs. Additional goals include evaluating Tactics, Techniques, and Procedures (TTP) that best exploit, promote, expand, and incorporate new FORCEnet capabilities in support of optimizing execution of Naval operations; increasing warfighter effectiveness through discovery and development of enhanced capabilities; and encouraging Government, industry, and academia use of experimentation to advance new concepts and capabilities. This year, for the first time, the event has been expanded to include a lab-based venue designed to experiment with lower Technology Readiness Level (TRL) candidates. The goal of this added activity is to demonstrate technologies that have the potential to fill mid- and far-term warfighting gaps. One of these lab-based experiments is secure cloud computing. Increased mission flexibility through a globally distributed and accessible IT infrastructure that is also open to use by Non-Government Organizations (NGOs), civilian first responders and non-US military forces. The use of a government sponsored “Red Team” is also being requested as a means of validating the security of the proposed infrastructure. Defense forces are using cloud computing technology today. I see it expanding in both public and private cloud use cases. Missions involving interaction with non-military organizations (i.e. humanitarian assistance), will leverage public clouds for reduced cost and improved access. Other missions will stick to private clouds built and maintained by the military..
Security on the cloud seems to be a challenge? Do you think this will be a problem for the defence forces to adopt cloud in a big way? This is an interesting post - thanks a million but having defence forces use computing in a cloud services such as Amazon or those from Security First raises some risk management issues, does it not?